On my very first Maui vacation, I enjoyed watching the sun rise over the crater at the summit of Haleakala. I expected that I would see a spectacular sunrise, and, indeed, I did. What I didn’t expect to see was the star show before the first light of dawn. My goodness! What a sight! I’ve never seen so many stars and “shooting stars” in all my life. I had begrudgingly gotten up at 2am in order to make the two-ish hour, winding journey up to the top of Haleakala before sunrise. (My traveling partners and I had erred on the safe side so we wouldn’t miss the sunrise.) When I reached the summit, I saw the sky loaded with stars – layers upon layers of stars from horizon to horizon. Any sleepiness I had from the abrupt 2am wake-up call was immediately exchanged with wide-awake-amazement. Keck-2 telescope on Mauna Kea. Photo credit to Paul Hirst. As you are making plans for your own Hawaii vacation, I’d encourage you to check out the night sky. On moonless nights, you’ll see the most stars and planets. If your vacation happens to fall when the moon is shining, you won’t see as many stars, but the view of the moon is quite nice, too. Since my Haleakala star encounter, I’ve learned that Hawaii is a hotbed for astronomy, because of the low light pollution and access to tall summits like Mauna Kea on the Big Island and Haleakala on Maui. 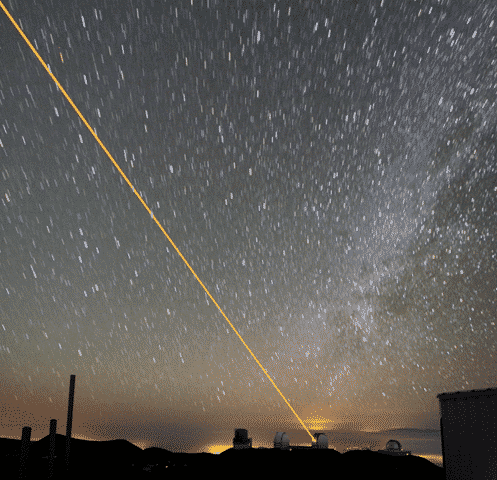 Another very intriguing draw to Hawaii for astronomy is Hawaii’s latitude. At 21 degrees North Latitude, you can see both the Northern Hemisphere and most of the Southern Hemisphere. Hawaii the only state in the US where you can see both the North Star and the Southern Cross. Of all the stars that are visible from the planet Earth, from Hawaii, you can see over 80% of them! * Astronomy calendar of celestial events. This calendar lists all the events, including moon phases. It can be useful for your Hawaii vacation planning, as well as what you might see from your home town. * I was able to interview the Maui Astronomy Club President, Becky Sydney. I’d encourage you to take a look at that Stargazing Q&A with a Hawaii Astronomy Expert. * On the Big Island, you can find tours that take you to the summit of Mauna Kea for sunrise and then to a lower elevation for good visibility and warmer stargazing with a telescope. See my article: Advice for Mauna Kea Sunset and Stargazing Tours. * On Oahu, the Bishop Museum has a great planetarium. Their website is useful too, for finding night sky events in Hawaii. * There’s loads of information for the astronomy-inclined at the University of Hawaii Institute for Astronomy. * If you’d like to see the stars from Haleakala, like I described, see my article with Haleakala sunrise tips, making sure you get there early on a moonless night. We’ve also taken a great Haleakala stargazing, sunset tour on Maui. * Some hotels offer stargazing programs from their rooftops. For example, you can find a stargazing experience at the Hyatt Regency Maui Resort in Kaanapali. I believe there is still one at the Sheraton Maui, as well. (UPDATE: I checked with Sheraton Maui and they are not currently offering the stargazing program.) Ask the concierge at your hotel for stargazing tours and/or advice. * Over the years, I’ve come across a few websites of catamaran tour companies that offer stargazing from the ocean for special night sky events. If that sounds of interest, I suggest you google for those kinds of tours. If all else fails and you want to see the stars, finding a dark spot from a beach or in the upcountry, is easy to do. Just try to get outside the main towns are resort areas for best viewing. Have you had an eye-opening stargazing experience in Hawaii? Please share in the comments. Our favorite time in Hawaii was when we did a tour up Mauna Kea on the big island to see the sunset, the observatories and then to star gaze. It is a must experience in your lifetime event! Tried to schedule a star tour with the Hyatt on Maui 3x, but each night it was cancelled due to cloud cover (was an April trip, quite a bit of vog that week, too). Relatives did the Stargazers Maui tour and gave it high marks. We wanted to try it but ran out of time. Plus, driving back down Haleakala at 3am sounded a little trickier than driving up it for the sunrise. I haven’t heard of as many voggy days recently. As long as the Tradewinds keep blowing, all is good. Followed your advice for a Kula Lodge breakfast after our Haleakala sunrise, which was great. As far as a Haleakala overnighter, friends of our stayed at one of the cottages that have near (or in, can’t remember) the crater itself. I believe there’s a lottery with the park itself to get reservations in advance. Sounds like it’d be fun, too. Great post. Stargazing is fantastic and there truly is no place like Hawaii to do it. Definitely will refer to your post links for planning activities next time visiting Hawaii. Thank you for your insights. A couple of weeks ago I stayed at the Sheraton on Maui and spent two nights watching a meteor shower over the ocean… It was incredible! !